Super sisters Stella and Ruby Blakely. City of Peterborough Swimming club (COPS) returned to the scene of their 2015 Junior Fenland League final triumph at Boston to begin the defence of their crown and they came away as winners once again. The Junior Fenland League is for swimmers aged 13 and under and each age group is subject to a cut-off time. Once a swimmer has achieved that time they cannot be selected again but they can swim in an older age group that has a faster time. COPS have two teams competing in the league and they were both in action at Boston along with City of Ely and St Neots Swans. Final result: COPS A 178 points, Boston 175 points, City of Ely 115 points, COPS B 108 points and St Neots Swans 87 points. 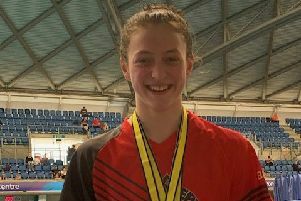 COPS A took 19 first places and 12 second places with Fenland League debutante Ruby Blakely (9) winning the 10yrs and under 50m breaststroke by nearly 4.5 seconds which makes her too fast to race in that event again. Laura Fehrenbach (10), Erivan Hamid (11), Mia Karagholi (9), Amy Paget (10), Bert Papworth (10) and Connor Walker (12) all broke the cut-off times in one or more of their events. COPS B took four first places with Lauren Browne (10), Stella Blakely (11), Kieran Griffin (9) and Isabel York-Forward (10) all winning while Jack Brown (12), Lewis Flower (11), Oskar Rajski (12) and Mia Turvey (9) all scored higher points than their A team compatriots in their races. Isla Fullock (8) was the only B team member to break a cut-off time in the nine years and under 50m freestyle. COPS A team: Olivia Bearman-Skipworth (9), Ruby Blakeley Lilly Borgognoni (12), Harley Brown (10), Fabien Brudnicki (12), Laura Fehrenbach (10), Holly Graves (11), Lili Griffiths (11), Erivan Hamid, Mia Karogholi, Kate Mcloughlin (12), Joshua Martin (10), Amy Paget, Bert Papworth, Stan Scarborough (9), Jack Underwood (8), Kieran Underwood (10), Connor Walker and George Whiteman (11). COPS B team: Stella Blakely, Jack Brown, Lauren Browne, Briony Burmby (12), Calleigh Coull (8), Joel Coulson (11), Cameron Fisher (12), Lewis Flower, Isla Fullock (8), Sophie Galjaard (12), Kieran Griffin (9), Safford Hewitt-White (9), Tegan Hughes (10),Oliver Ilsley (9), Emily MacFarlane (10), Oliver Macfarlane (11), Hannah Jakeman (12), Oskar Rajski, Joshua Spencer (11), Mia Turvey and Isabel York-Forward. COPS A host the second round of the Junior Fenland League on April 9 at the Regional Pool while COPS B will be competing at Whittlesey.